Be the first to share your favorite memory, photo or story of Gracia. This memorial page is dedicated for family, friends and future generations to celebrate the life of their loved one. 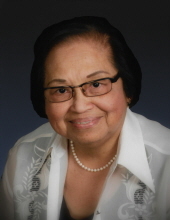 It is with great sadness that the family of Gracia Pacana shares the news of her passing on Wednesday, October 11th after almost a yearlong battle with cancer at the age of 78. Grace was born the 7th of 10 kids to Angela and Faustino Fortun on May 16, 1940 in Butuan City, Agusan Province, Philippines. She graduated from the University of the Philippines with a Bachelor of Science Degree in Home Economics. She had a passion for sewing and spending time with family - especially her granddaughters, and sharing her time and talents with her church family. She’ll be the one in heaven negotiating for a better place in line. She is survived by her husband of 50 years, Ronaldo; daughters Angel Pacana (Jeffrey), Maya Pacana-Bredenkamp (Shea) and Josephine (Jason) Clinton, granddaughters, Violet, Alex and Lily, brothers and sisters-in-law Ben (Claire) Fortun and Luis (Aurora) Fortun, sister and brother-in-law Irene (Pablo) Yabut; many extended family members and friends. Memorial donations may be made to Ron Pacana and will be disbursed among two charities Grace selected. To send flowers or a remembrance gift to the family of Gracia Pacana, please visit our Tribute Store. "Email Address" would like to share the life celebration of Gracia Pacana. Click on the "link" to go to share a favorite memory or leave a condolence message for the family.